ALL Six (6) Items for $ 3.00 -- MUST SELL -- Make me an Offer -- For ANY -- OR Multiple Items -- OR ALL !! Buyer to pay U.S. Shipping, or items can be picked up. Cash or Money Order only. One Hinged Box comes with a Surprise Item inside !! Very Collectible & All Items are in Very Good to Excellent Condition ! -- White with Red Cherries - Bottom is Stamped "HMK LLC". Measures 2-3/4 x 1-5/8 inches. -- Tea Table with Cream/Peach Ruffled Tablecloth with Gold Polka-Dots & Hem, & Double-Layered Pink Top-Cloth with Lace Trim - Set with a Vase of Flowers, Tea Pot, 2 Tea Cups filled with Tea & Gold Spoons on the side & a Platter of Cookies. Measures 3-1/2 x 3-1/8 inches (Base). -- Round with Floral Design on Top & Pink-Thatch Pattern Bottom. Measures 1-1/2 x 2-1/4 inches. -- Little Girl having Tea with her Teddy Bear. Teddy Bear has a Pink Cloth Ribbon around it's neck & Table Cloth is also Cloth - White Eyelet. Table is set with a Tea Pot, 2 Tea Cups & Saucers, and inside is a Platter of Heart-Shaped Cookies. Bottom says "PHB Collection designed by MCP". Measures 1-3/4 x 2-7/8 inches. 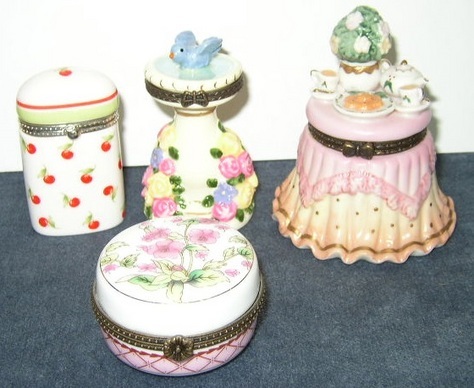 See More Trinket, Ring Boxes, Holiday Trinket Boxes posted for sale in my online store !